Summer is starting to heat up, and the city of Toronto is scorching. Good thing June is National Iced Tea month! So, how do you make healthy iced tea you ask? It’s easy! 1) For iced tea to be ready instantly: Double the amount of loose tea you’d usually use in a serving. (If normally 1 tsp per cup, use 2). Steep normally then remove the leaves. If you’d like to sweeten it, now’s the time to add sugar. Pour the tea over a glass of ice, and *voila*, your iced tea is ready! 2) For iced tea to be ready later: Make your tea as you normally would (add sugar/sweetener if desired). Put it in the fridge, wait for it to cool, and drink! Be sure to use enough tea for the amount of water you’re using based on the type of tea. If you are adding ice, use extra tea when steeping. (Ice dilutes it further). 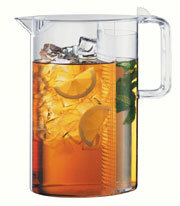 The “Ceylon ice tea with filter” bodum is also fantastic for steeping iced tea. As the site says, “The CEYLON Ice Tea Jug is the solution for preparing ice tea as nature intended, with the use of fresh tea leaves! Durable clear plastic removable filter allows for brewing to exact preference. Brew and drink from the same container- no more mixing stale, sugary tea powders! The CEYLON is made of BPA-free plastic and its transparency allows you to make a beautiful visual presentation when serving sangria, ice tea or any fruit infused water imaginable.” It comes in different sizes too. I personally use one of these, and the filter in the jug allows for a quick and convenient mix of iced tea with loose leaves. Use one of the two methods above to prepare, and remove the strainer when it’s fully steeped! Just prepare to go through a lot of tea when you keep going back to make seconds! For some iced tea recipes it’s suggested to double the steeping time – just be wary as you may have to add more sweetener since it can get bitter. I find the best tea to make iced tea with are fruity ones. Berry flavoured green teas are great. Herbal blends are also fantastic – especially the fruit and berry mixes. Rooibos also makes a nice iced tea – try it with a peach flavour. I also like to play around with other add ons for my iced tea recipes. In the past, I’ve mixed different types of fruity teas, added lemon, lime, mint leaves and fresh fruit! The best way to find out what you like is just to experiment with a bunch of different recipes. The smallest change can alter the taste. 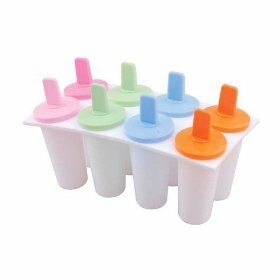 It’s also fun to make ice freezies/Popsicles! I like to triple the amount of tea when steeping, and add a lot of sweetener. Then pour it into ice cube or Popsicle trays, freeze and you have a fun snack! Please share your fun ways of drinking tea in the summer here. It’s always great to learn new recipes to beat the heat with! Pictures of my iced tea recipes to follow as I create them this summer! Happy summer, and happy steeping, everyone!